Definition - What does Standing Cow Face Pose mean? Standing cow face pose is a variation of the basic foundational mountain pose with the challenging arm position of cow face pose, requiring shoulder flexibility. 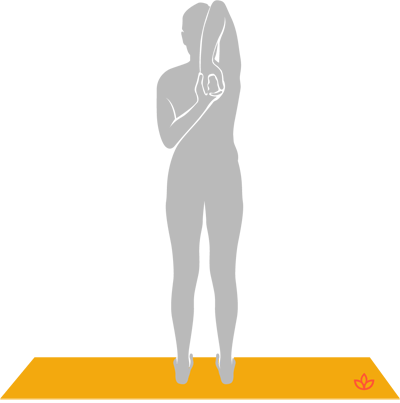 Practice of this posture begins in mountain pose (tadasana). To add the cow face pose (gomukhasana) arm position, one arm reaches behind and up the back while the other reaches over the shoulder and down the back with the fingers interlocking. It is also known by its Sanskrit name, tadasana gomukhasana. For yogis whose flexibility does not allow the hands to meet, a strap can be used to assist in the arm position. The shoulders should remain relaxed. For more of a challenge, the eyes can be closed. Yogis with shoulder, neck or wrist injuries or with heart conditions should skip standing cow face pose.